The Event last night was a great success! Thank you to all our participants, sponsors, contributors, volunteers and the artists who make this all possible. 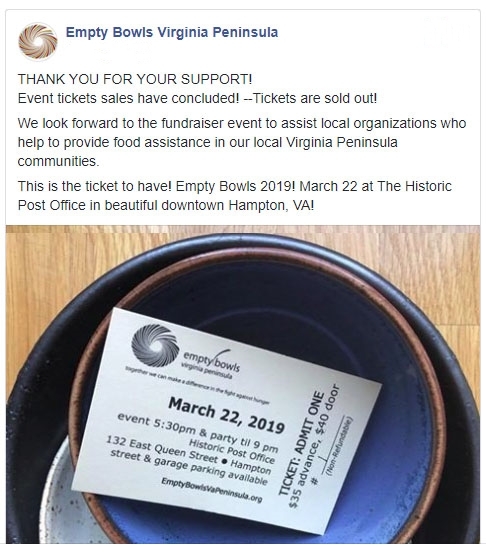 Heartfelt Thanks to all the Empty Bowl Supporters! We are grateful to our restaurant supporters who make our event delicious! The Point located in Hampton. Huntington House located in Newport News. | | | We need Volunteers! 100% of your gift is tax-deductible. © Copyright Empty Bowls VA Peninsula .